They have been injured and released with a complicated rescue. No swimmers have been injured. 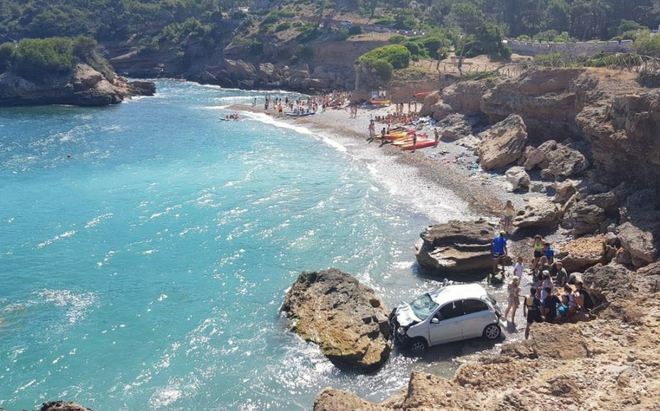 A 58-year-old man and a 53-year-old woman, both of Belgian nationality, were injured this morning as the vehicle in which they were travelling from the car park, about 8 meters high, rushed to the sea to the shore of the beach s’Illot, in the Mallorcan municipality of Alcúdia. Everything indicates that the cause of the accident was confusion when selecting the march. A couple of tourists was in a parking lot and instead of turning back to leave, the driver has put the first, accelerated, the vehicle has broken the wooden barrier that served as protection and has fallen on the seashore, according to has confirmed the Civil Guard. Fortunately, no bathers have been injured nor have any spills occurred. Agents of the Local Police and Firefighters of Mallorca – of the parks of Inca and Alcúdia – have carried out a complex rescue with a crane of the couple so that they could be taken care of by the services of emergencies. As a result of the accident, the man has suffered several fractures and has been transferred without serious condition to the General Hospital de Muro. The woman has been mildly poly-educated and has also been taken by ambulance to the same hospital, reported 061. The event occurred around 10.55 hours.